While foreign tourists flock to Chiang Mai, Phuket, and Koh Samui, Thais – especially well-heeled Thais – favour Hua Hin, which is 230 kilometres southwest of Bangkok. The oldest of Thailand’s beach resorts, Hua Hin was discovered in the 1920s by King Rama VII, who thought it would make an ideal summer getaway from sultry Bangkok. The king had a sprawling residence, called Far from Worries Palace, built in 1928. The sleepy fishing village was turned into the favoured holiday resort for Thailand’s rich and famous overnight. They also built ocean front homes on either side of the open-air royal palace. Hua Hin now has golf courses, stylish retail outlets, and a thriving night market. Eating out ranges from modest stalls selling seafood and other local specialties to fine dining. Accommodation runs from international five-star chains to boutique hotels to secluded villas. 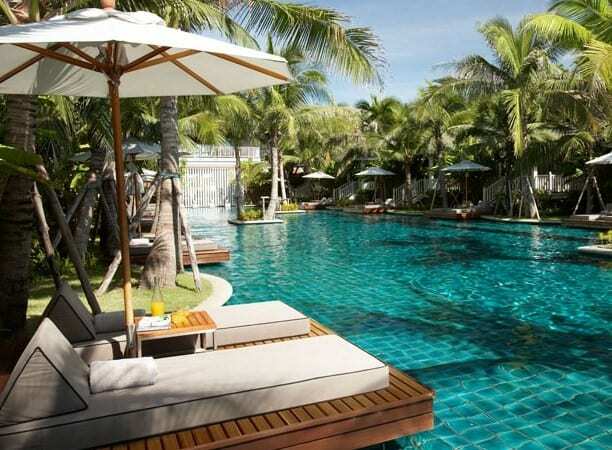 I’m staying at the Rest Detail Hotel Hua Hin, which overlooks the Gulf of Siam. There are 56 units, running from 48-square-metre rooms with balconies or terraces to the Grand Rest Pavilion, a 485-square-metre split-level bungalow with four bedrooms, living and dining areas, and a private pool. Breakfast is served at Rest Gastro. With both indoor and outdoor seating, it offer buffet breakfast with both local and international favourites. Lunch and dinner are served at Rest Scene, which is located adjacent to the swimming pool. The menu runs from Thai to Mediterranean, and everything I have tried is yummy Barbecued seafood is available in the evening. Morning, afternoon, and high teas are served at the Leaf. Pictured: Cottages in Pool Village have terraces with direct access to a large swimming pool. Platforms with two sun lounges jut into the pool.